When an inverter is connected to load, the output voltage of inverter is controlled due to following reasons. When there is any change in input supply source, the output also changed. When the frequency or speed changes, the output of inverter also changed. This is done particular in the induction motor speed control by inverter. 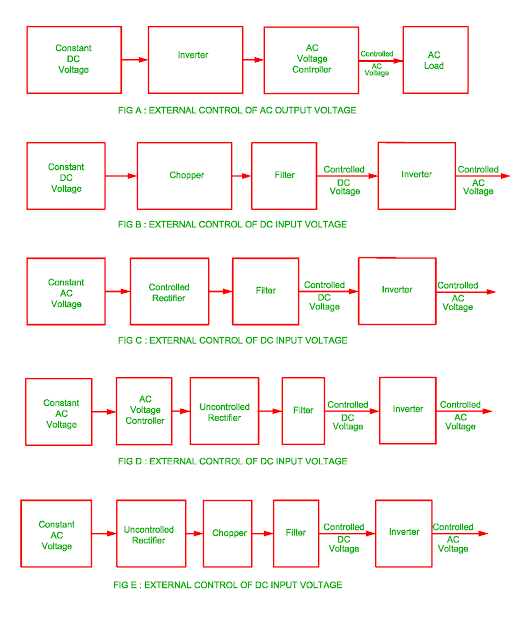 The output voltage of inverter is controlled by following methods. The AC voltage controller is connected between load and inverter output. The load voltage is controlled by controlling firing angle of ac voltage controller. As the harmonics is produced in the output voltage, this method is used for low power application. The chopper is connected between inverter and DC input source when the input supply is DC. The output voltage of inverter changes due to change in chopper output voltage. When the input supply is ac, the ac to dc conversion is done by controlled rectifier. The DC voltage is adjusted by controlling firing angle of controlled rectifier. This will result in output voltage of inverter is also adjustable. When the input voltage is ac, the ac output voltage is controlled by ac voltage controller. The ac to dc conversion is done by uncontrolled rectifier therefore the inverter output voltage is adjustable. When the input voltage is ac, the uncontrolled rectifier converts ac into dc. The chopper converts fixed dc into variable dc supply and the output of chopper is feed to input of the inverter. There are following advantages and disadvantages of above mentioned methods. When the inverter output voltage is adjusted by controlling the dc input voltage, there is no change in output waveforms and harmonics. When the inverter output voltage is adjusted by controlling input supply source, the design of inverter is done for specific voltage limit and its efficiency increases due to small power loss. 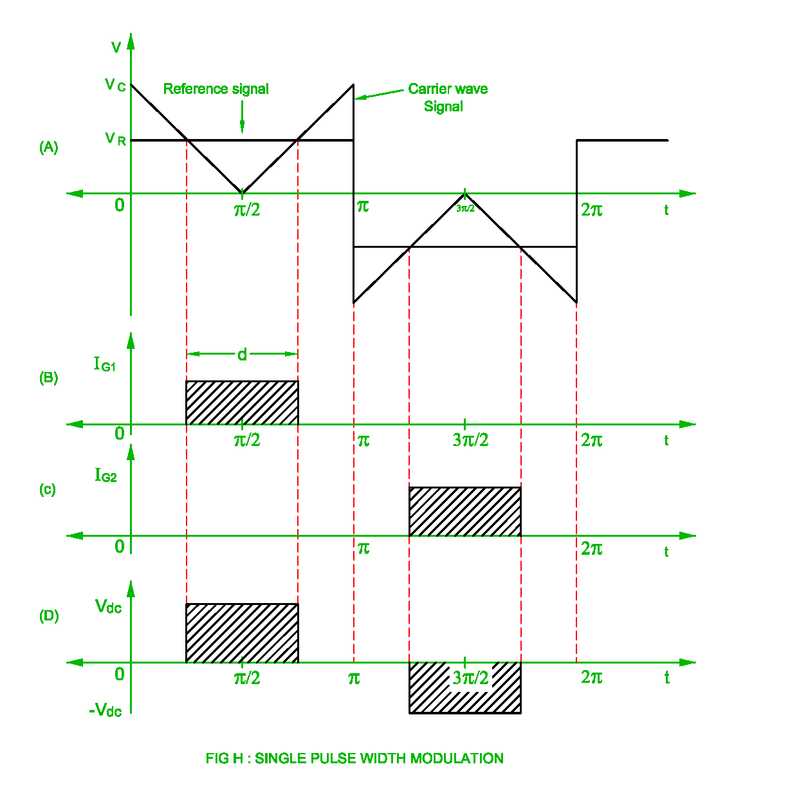 There is filter requires at the input side of input in order to reduce DC voltage ripple. This filter circuit increases the weight, volume and cost of inverter. The inverter efficiency decreases as the power stages increases more than one. When it is require to control output voltage for constant current, the DC input voltage control method used because the commutating capacitor voltage decreases as the DC input voltage decreases and this will result in turn off time of SCR decreases. When load is connected at the output of inverter, the output voltage of inverter is controlled by internal control of inverter. 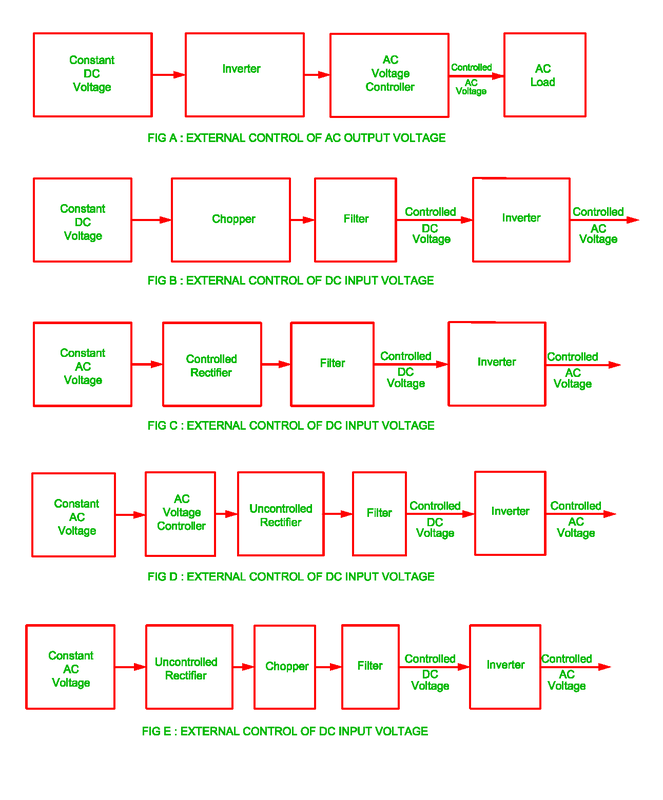 There are following methods of internal control of inverter voltage. This method is also called as multiple inverter control. There are two or more than two inverters connected in series in this method. The output of the inverter is connected with primary winding of the transformer whereas the load is connected to the secondary winding of the transformer. The load voltage can be changed by changing the firing angle of the inverter. This is most efficient method of inverter output voltage control. The constant DC input voltage is applied at the input of the inverter and output voltage is controlled by switching semiconductor device of the inverter in this method. There are no necessary of any extra components to control output voltage of inverter. As the low order harmonics ( 3rd, 5th ) reduces whereas higher order harmonics ( 7th , 9th and 11th ) are filter out, less requirement of filter. As the switching semiconductor device requires low turn on and turn off time, cost of semiconductor device increases. As the semiconductor device receives only one pulse during one half cycle, one semiconductor device is switched on. The output voltage of the inverter can be controlled by controlling width of pulse. Figure H shows the gate signal and output voltage waveform for single phase full bridge inverter. The gate signal is generated by comparing VR amplitude reference signal and VC amplitude control signal. 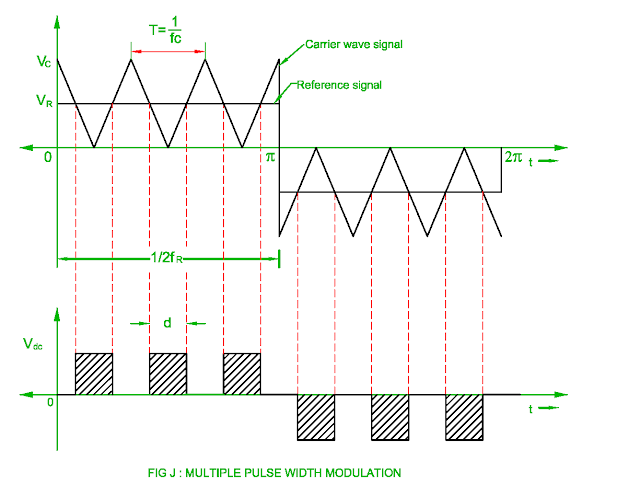 The width of gate pulse can be varies from 0o to 180o by controlling the reference signal from 0 to VR. This will control the output voltage of the inverter. The frequency of the output voltage depends upon frequency of reference signal. The amplitude modulation M is ratio of reference signal ( VR ) and carrier signal ( VC ). The analysis of waveform shown in the figure A is done by fourier series. The output voltage becomes maximum when the width of pulse becomes π radian. The graphical representation of pulse width in degree ( x – axis ) and n = 1, 3, 5 and 7 ( y – axis ) is shown in the figure I. When a value of the fundamental component becomes equal to 0.143, the third, fifth and seventh harmonics becomes equal. This will conclude the higher harmonics remains present when the output voltage is low. There are more than one pulse per half cycle in the MPWM. These gate pulses are used to control output voltage of inverter as well as reduce harmonics. The magnitude and width of the pulses are equal in this method. The reference signal and higher frequencies carrier signals are compared in this method in order to generate more than one gatting pulses. The number of gate pulses depends upon carrier frequencies whereas the output voltage depends frequencies of reference signal. As the number of pulses increases in the each half cycle, lower order harmonics reduces but higher order harmonics increases. The higher order harmonics are reduced by using filter. It is to be noted that the switching losses of the semiconductor increases as there are more number of pulses per half cycle. This modulation technique is also called as symmetrical modulation control. 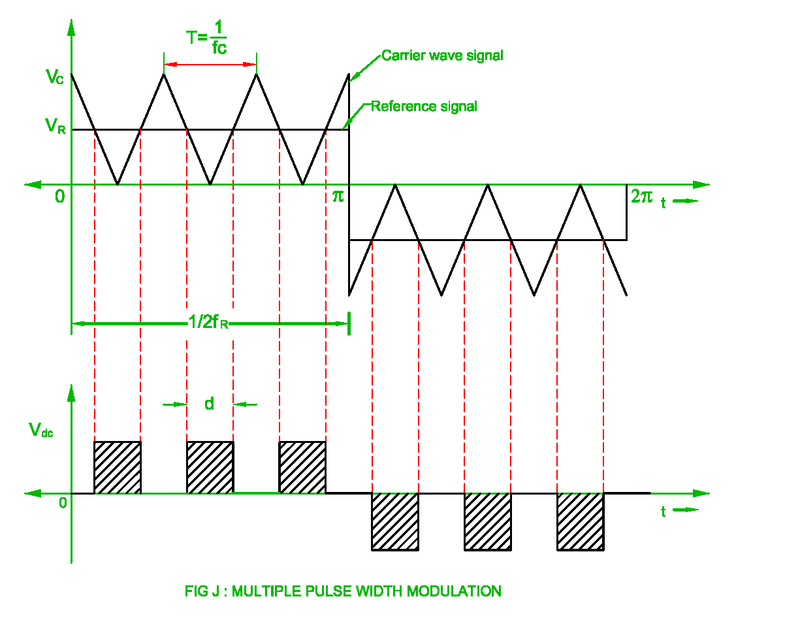 The reference signal is taken as sinusoidal waveform whereas the carrier signal is taken as triangular waveform in this method. 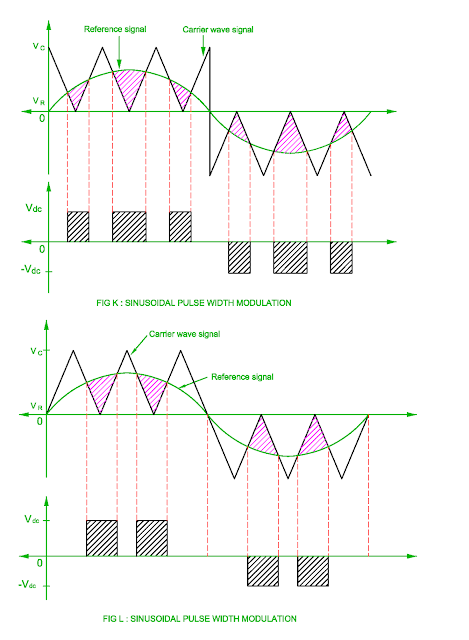 The width of pulse in the SINPWM is not equal due to reference signal is taken as sinusoidal waveform. The amplitude of sinusoidal waveform is also not constant. The width of gate pulse is determined by intersect point of the sinusoidal waveform and triangular waveform. The frequency of inverter output voltage depends upon frequency of reference signal fR and amplitude of reference signal VR controls the modulation index ( M ). 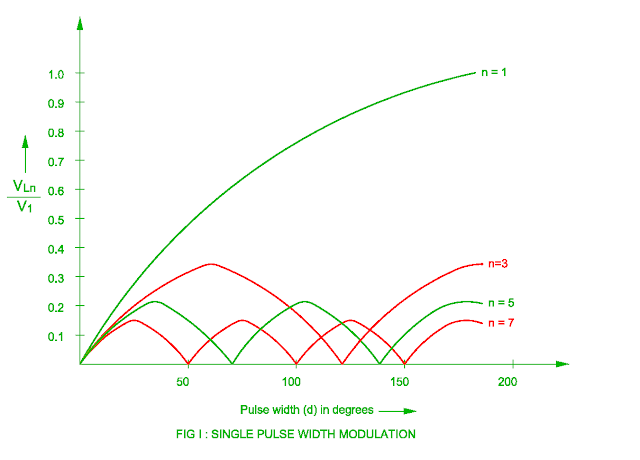 The number of pulses per half cycle when the amplitude of triangular waveform becomes maximum and sinusoidal waveform becomes zero. The number of pulses per half cycle when the amplitude of triangular waveform and sinusoidal becomes zero at same time. 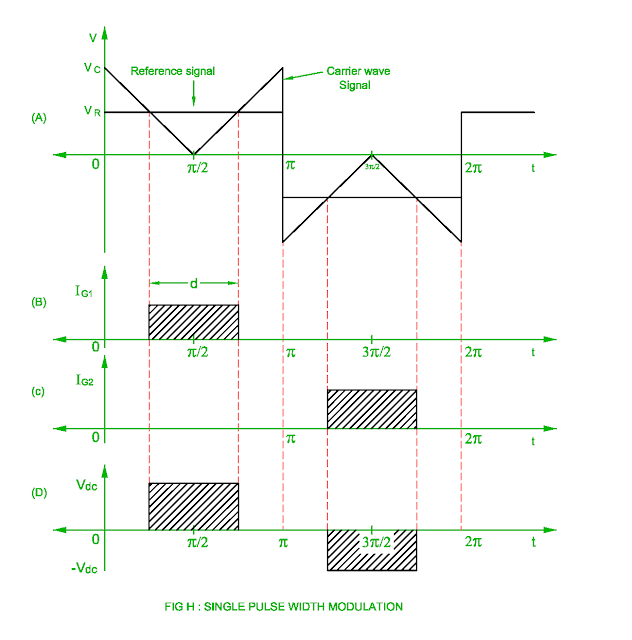 The analysis of harmonics is done in the sinusoidal PWM control is below. As the number of pulses per half cycle increases, the higher order harmonics also increases. Let NP = 4, it will generates 7th harmonic and 9th harmonic but higher order harmonics are easily filtered out. As the number of pulses increases per half cycle, the switching losses also increase and it will affect the efficiency of inverter. When the modulation index is greater than one, lower order harmonics induces in the output of the inverter.